So ive begun some half hearted research into building an electric violin (half gearted because there is little info out there relatively) and i read that playing an electric violin is easier than acoustic. Is this true? If so in what way? Why build one? I mean there have to be dozens of models available already? Nevertheless, it is pretty cool that you want to build one and I envy that skill. I could quite literally spend the rest of the day answering that question and i even shut down a bit thinking of all/how to answer that lol. It's hard coded, I'm an artist/inventor/engineer/adventurer. What i would build wouldnt be a homemade violin, it would be functional art. Why learn to play the violin when you can scroll over to youtube and listen to heifetz or hahn? Perhaps this long article can offer some insight. Very interesting! I hope you show us what you come up with if you ever go that route! Me too, and i think ive come up with exactly how im going to do it. Watch eBay. I picked up a "non-working" Cecilio for $50 complete with case and bow. The bow is pretty much junk, even though it had never been used. I put new strings on it and a little repair to the battery connector, and it works perfect. My main reason for buying it was to be able to practice without disturbing the wife (never good to disturb the wife!) since I hadn't played in over 20 years. I can't say it is easier to play than the acoustic, but it is fun to play with effects through an amp.............When no one is home but me, that is! 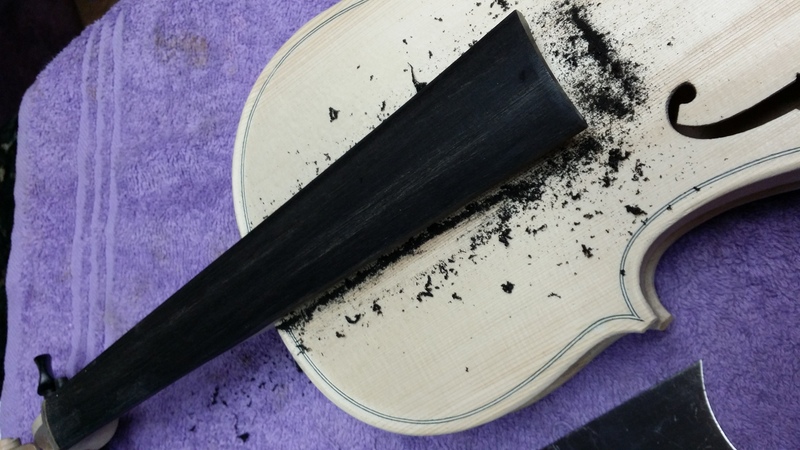 I've built several electric violins (5 string) and one very nice acoustic (which I didn't like that much but only because of all the critical dimensions and craftsmanship skills required to be exercised in the construction of it which took a lot of time. I have a lot of links to parts and supplies and if you ask I'll share what limited info and skills I have. That would be awesome cdennyb! I basically need the electronics and im going to scavenge parts from a busted violin. Where are you getting your parts? I get the modules and pickups from e-bay exclusively. I have a seller that I deal with all the time and they ship quick and I've never got a bad part. Usually get a better deal if you buy more than one and before you just pay the asking price, tell them what you would like to pay, make an offer usually about 20-30% less and see what they say. I've been able to save a few bucks that way. Suppose the same part would work for a cello? The link is for a ukelele so im assuming so. Dont suppose you know where i could get a custom fingerboard? The link is for a violin but yes you are correct. Violin, Ukelele, viola, cello,,, pretty much all string instruments, even cigar box guitars. Dennis is definitely a good one to consult for advice. Actually I found the electric (also run thru effects boxes of various models) to be easier to play than an acoustic, which I learned on for 3+ yrs. I found the ability to achieve perfect if not just acceptable intonation is far easier because the effects tend to 'cover up' tiny imperfections in your playing. Developing muscle memory for wrong intonation doesn't do you any favors and if you develop good if not great intonation with an acoustic violin, then you'll be sounding like a master on the electric. if you don't master the fretless acoustic violin first, you will be far behind when it comes to truly being able to say "I play the violin". Your intonation will suffer and the first time you are placed on the 'hot seat' so to speak and someone hands you an acoustic to show them your mastering abilities, you'll end up sounding like a first year student who needs a LOT of practice! Ha. very embarrassing. I prefer to make and build as I too am an engineer, craftsman, designer and love doing with my hands. Now that I've mastered building both acoustic and electric cigar box guitars, both electric and acoustic violins, and electric cellos... I have a new found admiration for anyone who can play a string instrument! My practice sessions are now measured in hours instead of minutes. Gotta love the passion for playing...balanced with the ability for making. I am glad you posted this because I have been neglecting my electric violin. And in my opinion it seems easier to get a better sound because of the effects. I mean if the note is wrong .. .the note is wrong.. but the effects do help to even out bowing issues and scratchies. I keep forgetting my dedication to Electric Fridays.. where I get to splurge and play with my electric violin. I sure do love it. I also am going to make and electric Cigar Box Guitar... and that will be fun to play with as well. I bought an electric pick up from China (fingers crossed) for about $8.50. I will let you know how it turns out..but yea.. it is for a CBG. Good luck on your build. I hope to see pics.